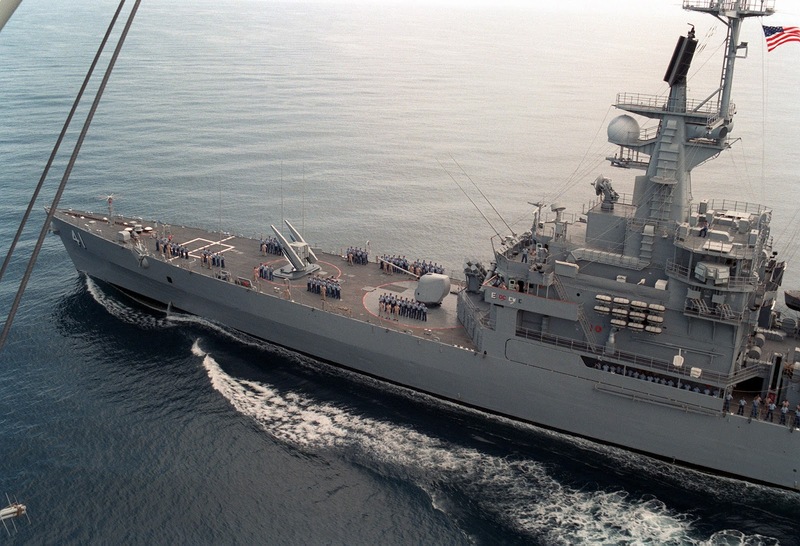 The double ended Virginia class cruiser with her flight deck as it was before the refit. The Virginia class cruisers were built as improved versions of California class nuclear-powered cruisers and they share similar layout. 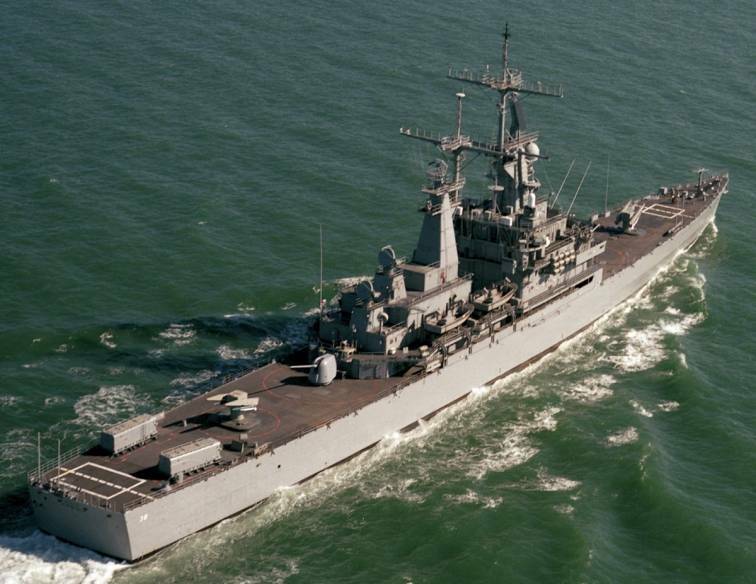 The main difference was the new Mark 26 twin-arm launcher instead of the Mk 13 launcher of the California class ships and the absence of the ASROC launcher. 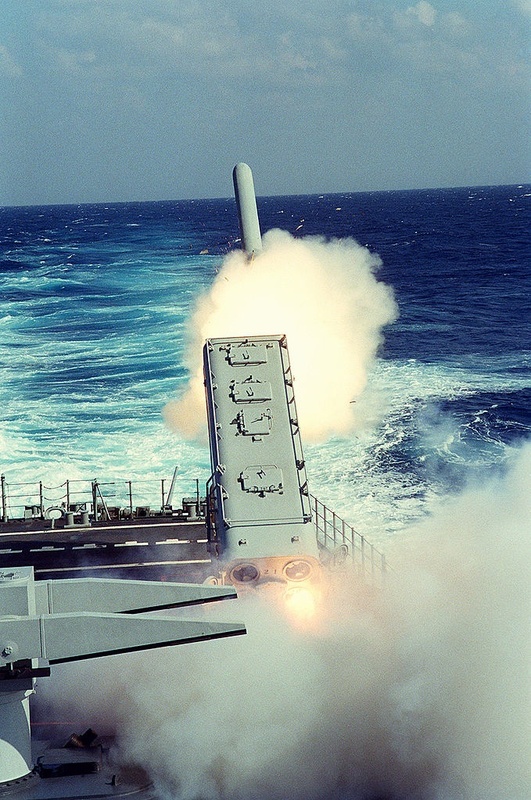 The Mk 26 could launch also ASROC rockets except the Tartar surface-to-air missiles (SAM) which were replaced by the SM-1 SAM later on (the latter where replaced by the even more advnaced SM-2 SAM) and thus a separate ASROC launcher was not needed. The elimination of the separate facilities for ASROC enabled the hull to be shortened by 3.3m. 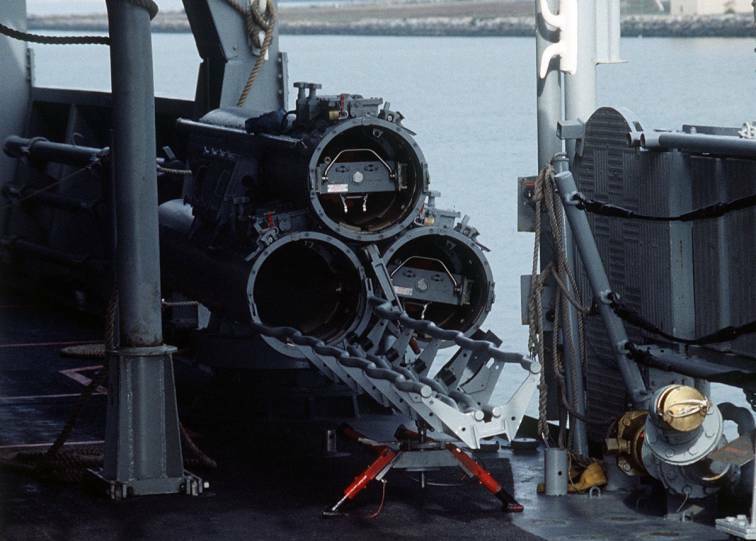 The introduction of the SM-2MR which needs target illumination only in the terminal phase enabled the two forward SPG-51 trackers/illuminators of the Californias to be eliminated and thus reducing top weight. 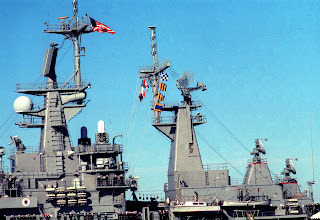 Moreover, in comparison with Californias, the new vessels had a hangar to accommodate one helicopter. 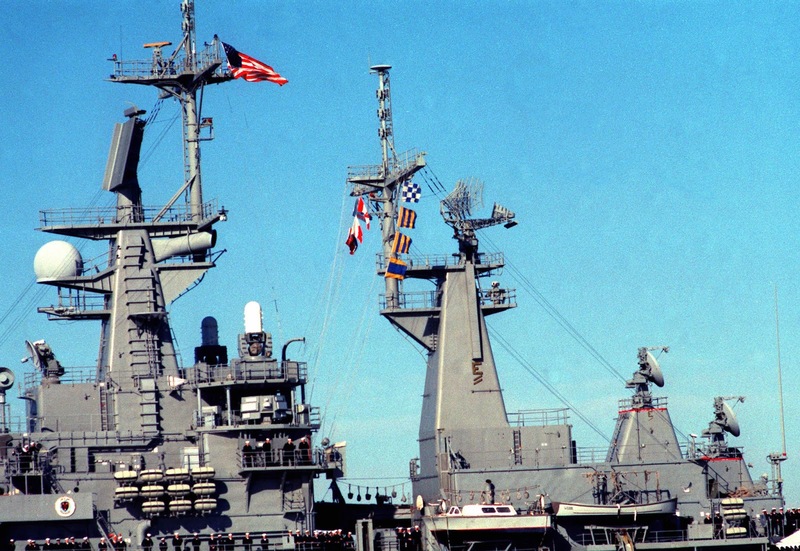 This helicopter hangar was beneath the quarterdeck, a quite unusual feature. 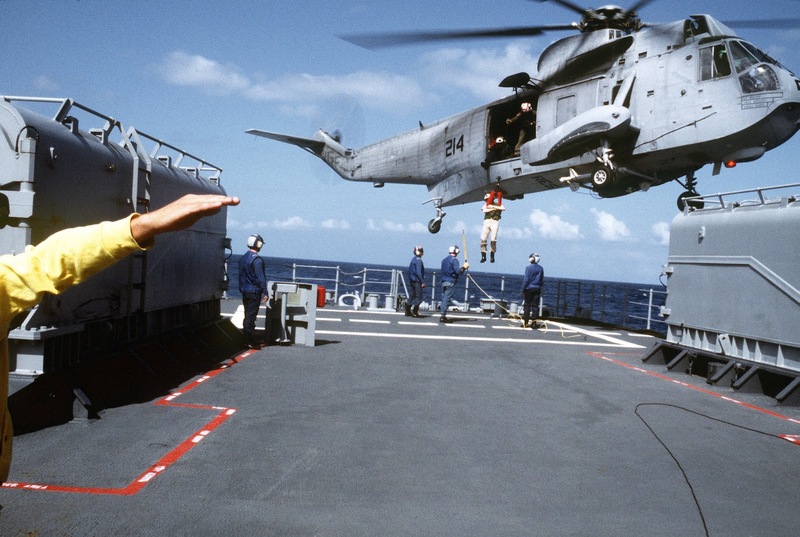 A lift transferred the helicopter from the flightdeck to the hangar. The helicopter hangar measured 12.8m x 4.3m and was served by an electro-mechanical elevator covered by a telescopic hatch. 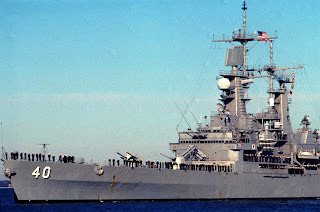 This arrangement in a ship other than an aircraft carrier was the first (and last) since the De Moines class cruisers of the '40s. 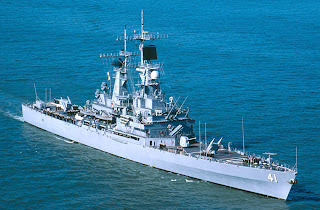 In general the ships of the class had similar (and sometimes improved electronics) with the California class, especially after the refits of both classes. The ships of the class also had limited armor around important parts. 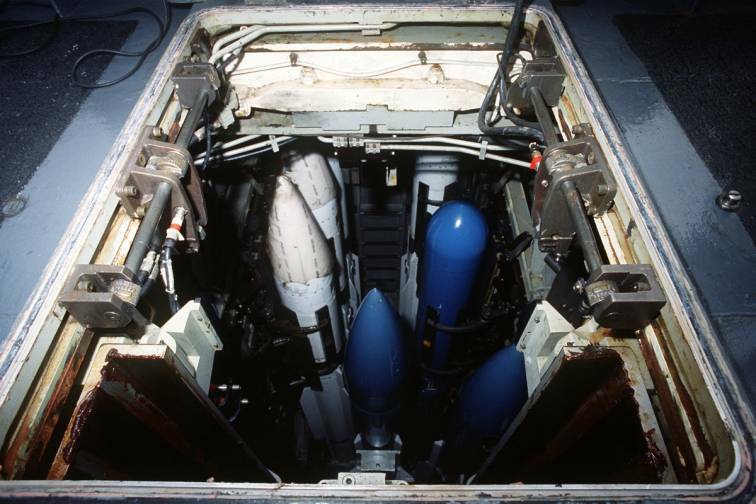 Specifically, one inch Kevlar plastic armor was installed around combat information center, magazines, and machinery spaces. 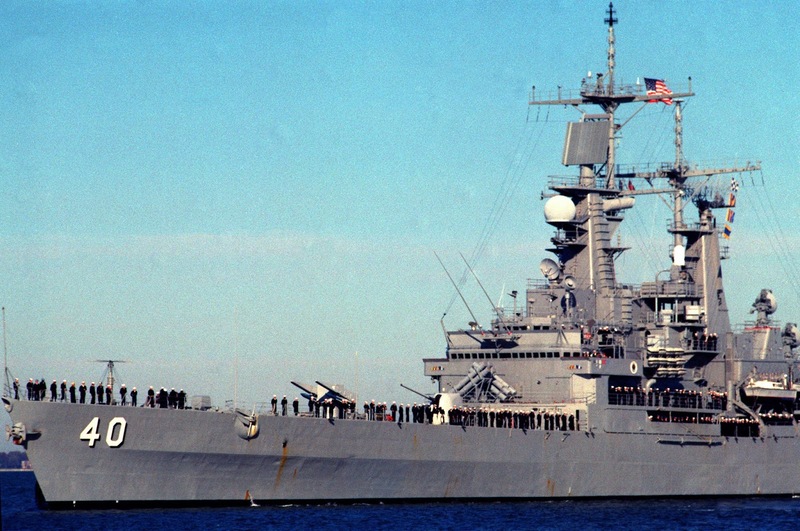 Modified photo of a Virginia class cruiser of the U.S. Navy. For a high resolution image click here. 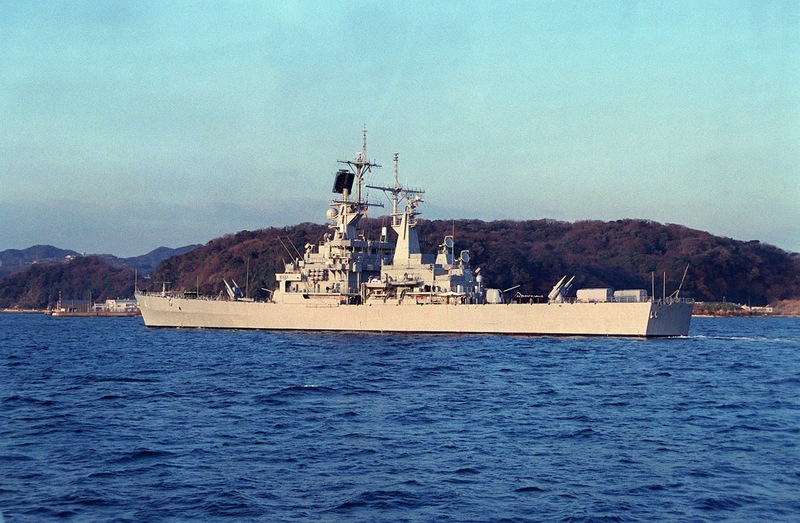 after her refit in 1985. 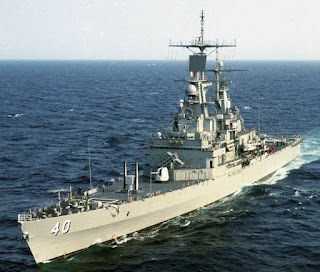 ﻿﻿﻿﻿During the ships' refit in the late 1980's, the Virginia class cruisers received gradually the SM-2 MR (RIM-66J) SAM that replaced the SM-1 (SM-2 has double the range of SM-1, about 80km range), two Phalanx close in weapon systems (CIWS), two quadruple Harpoon launchers and Tomahawk cruise missiles (known as Tomahawk Land Attack Missiles - TLAM) in two armored box quad launchers installed at the flightdeck. 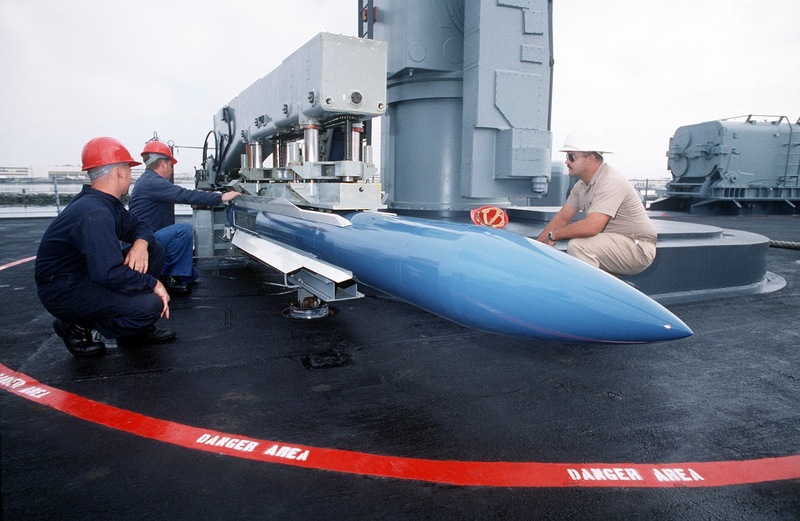 The Tomahwak missiles were installed after a decision was taken to remove the helicopter from the ships' equipment as the Virginias were encountering problems with the elevators and in keeping the hangars watertight. 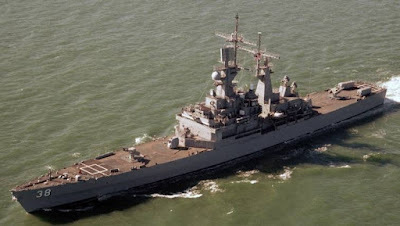 Therefore, the capability of the ships to carry a Kaman SH-2 Seasprite LAMPS (Light Airborne Multipurpose System) helicopter either in the hangar or stationed at the deck, it was eliminated. 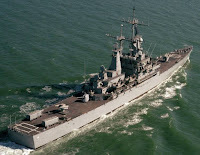 Their electronics and sensors also were upgraded or replaced by more modern ones (such as the AN/SPS-49 radar, although USS Virginia kept the older AN/SPS-40). 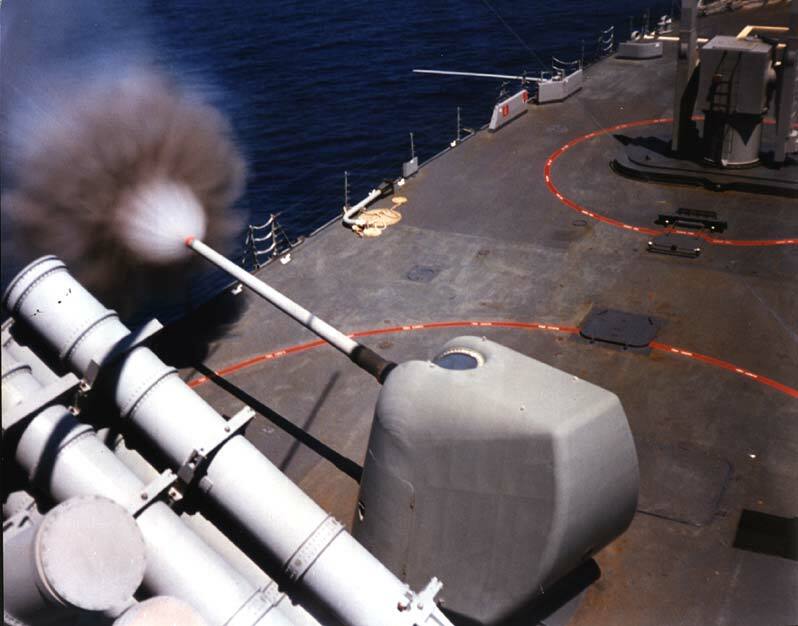 BGM-109 Tomahawk TLAM is launched toward a target in Iraq from a Mark 143 Armored Box Launcher (ABL) of USS Mississippi (CGN-40). 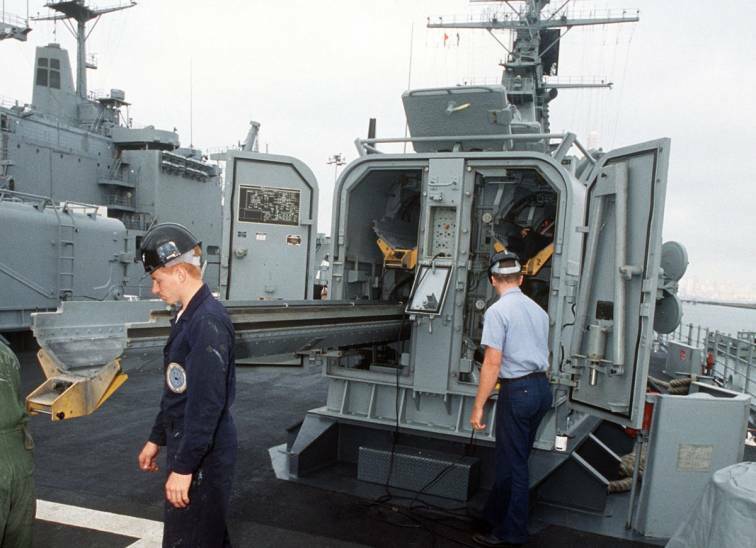 launchers and the Mk 26 launcher. 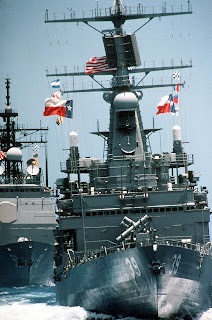 Virginia and Mississippi served with the Atlantic Fleet and Texas and Arkansas with the Pacific Fleet. 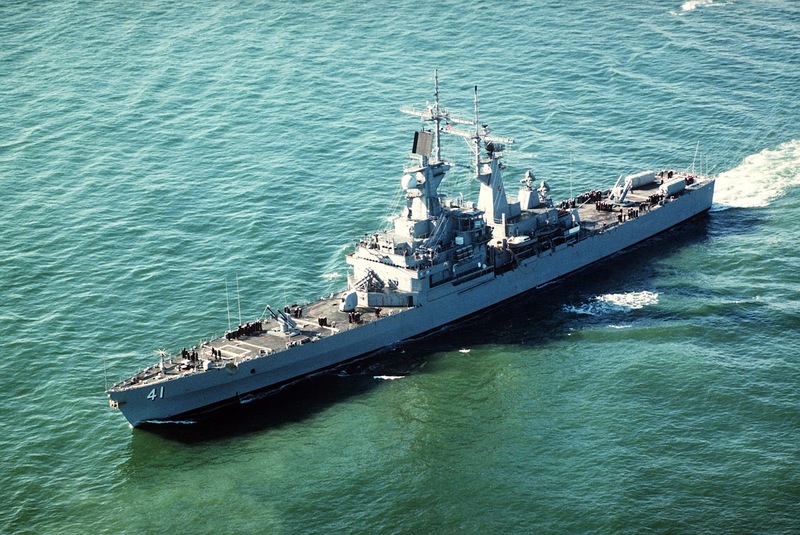 Two proposals for the construction of modified Virginia cruisers fitted with Aegis system were cancelled in 1979 and 1983 respectively. Planned Refueling Complex Overhauls were cancelled in the early 1990s due to the expense of maintaining the nuclear propulsion components and the requirement for high manpower (Virginias had a crew of about 600 men! 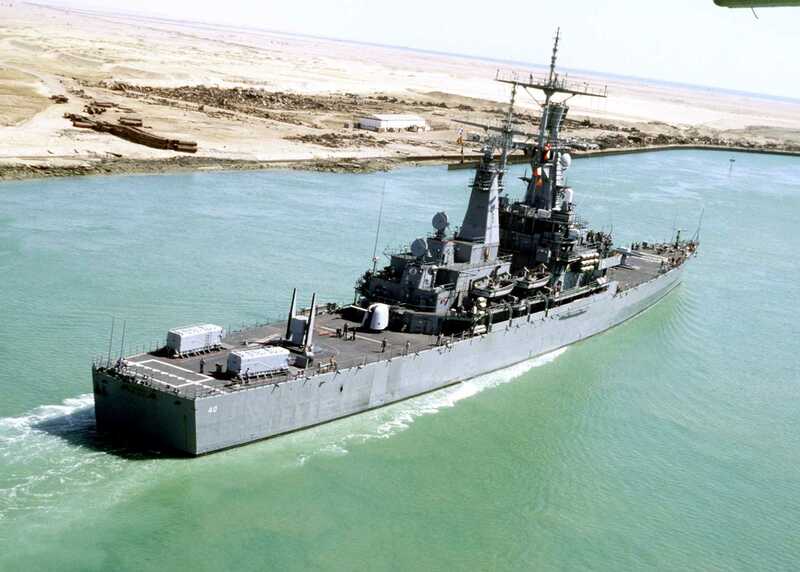 ), and the ships were all decommissioned after a relatively brief period of service averaging somewhat less than two decades. Thus, the Arkansas, the last of the class that was commissioned in 1980 with a life expectancy of 38 years, though it was decommissioned in 1998 after less than half that period in service. while flying the state flag of Texas. USS Arkansas (CGN-41) at sea in 1985. 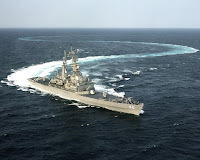 USS Mississippi executing a turn. 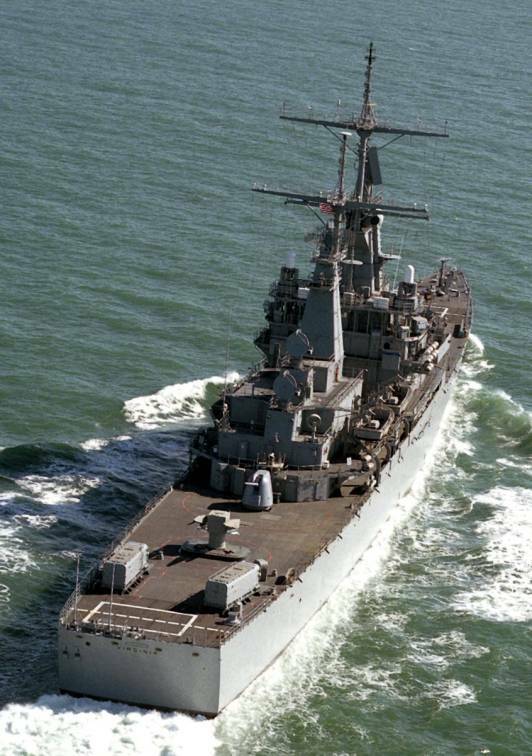 The early retirement of the Virginia class cruisers was criticized by some circles that time. 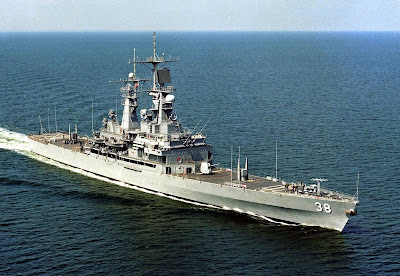 They were new, modern ships; given a New Threat Upgrade electronics overhaul, they would have been well-suited to modern threats. 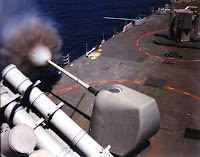 They had rapid-fire Mk 26 launchers that could fire the powerful Standard SM-2MR medium-range surface-to-air missile - earlier decommissioned cruisers used the slower-firing Mk-10 launchers, which required manual fitting of the missiles' fins prior to launch. 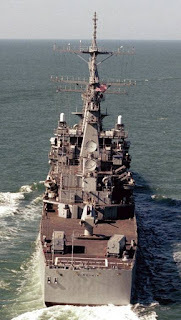 Nevertheless, the Virginias, with their Mk 26 missile launchers and magazines, were incapable of carrying the SM-2ER long-range surface-to-air missile, being restricted to the SM-2MR medium-range surface-to-air missile. 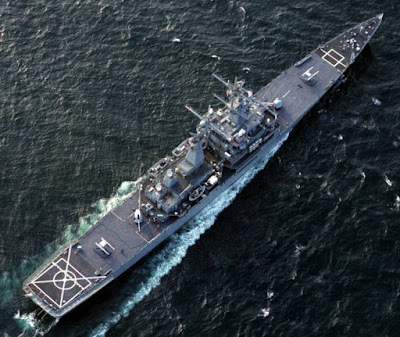 This was a significant limitation in their capabilities. 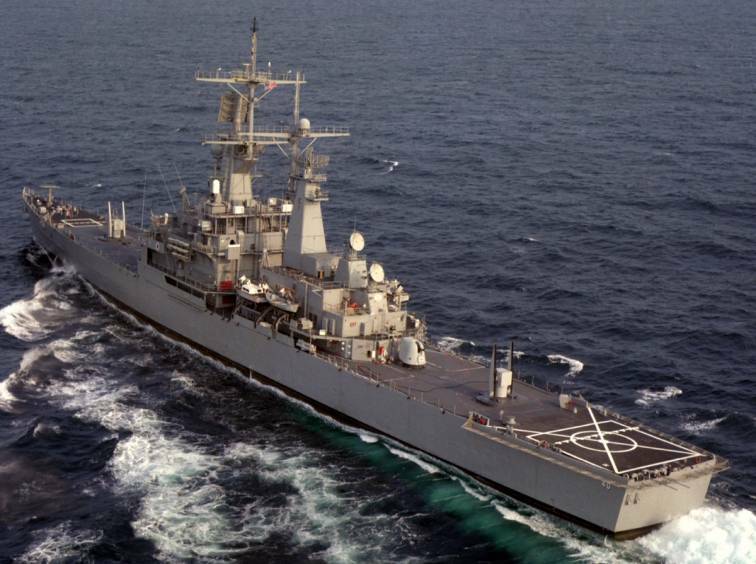 Another weakness was the loss of LAMPS helicopters, due to the installation of Tomahawk cruise missile launchers. 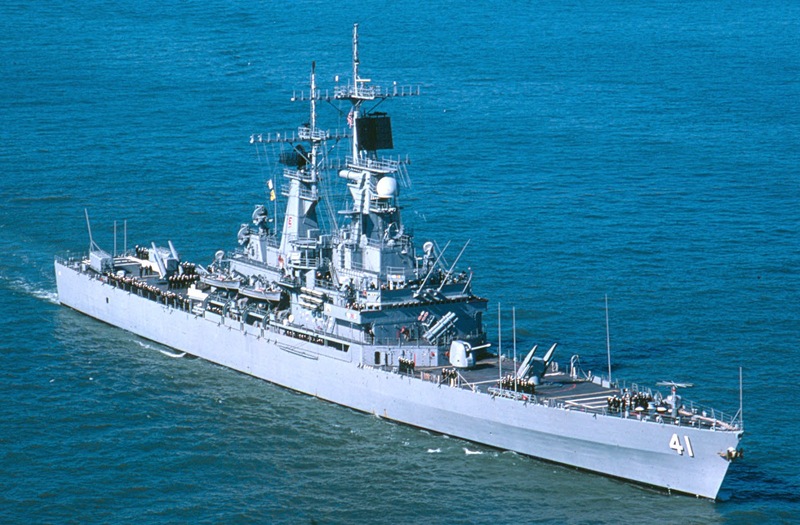 ﻿﻿﻿﻿﻿﻿﻿﻿﻿﻿﻿﻿﻿﻿The Virginia class cruisers were the last nuclear-propelled surface ships (other than aircraft carriers) to be built by the United States Navy. In 1999, one year later than the decommissioning of the last ship of the class USS Arkansas in 1998, their two older cousins, the Californias, were retired and thus the era of nuclear-powered surface combatants of US Navy ended. Thank you John, I corrected them. 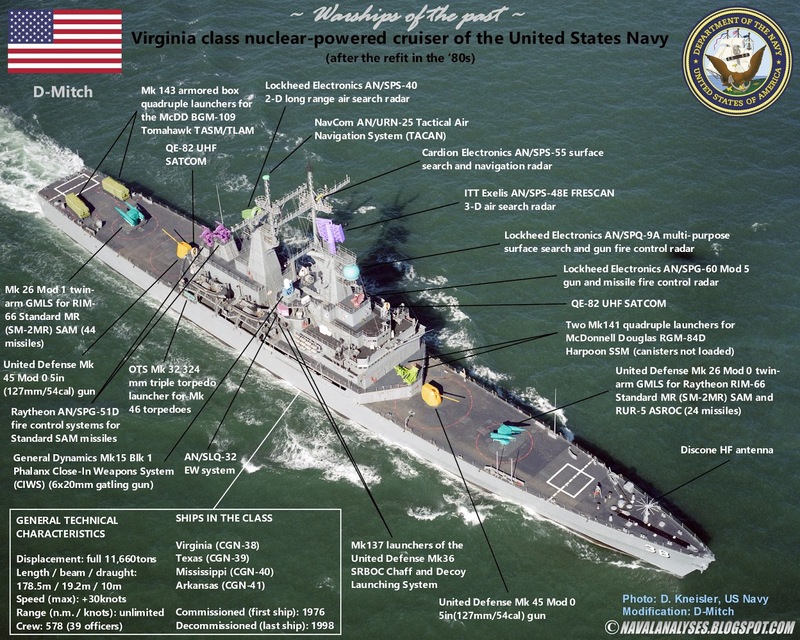 I have a minor correction for you - the Virginias were commissioned as Tartar/SM-1 ships and did not receive SM-2 until the NTU in the late 1980's (indeed, SM-2 production didn't even start until 1980 - 4 years after Virginia commissioned), so the loss of two illuminators was indeed a problem. You are right, thank you so much for the correction! I will update the article asap.